Students investigate the use of biological molecules as materials and use enzymes as chemical sensors in the design of diagnostic tests for peroxide, cholesterol, and glucose. By incorporating everyday materials into science lessons, the Materials World Modules (MWM) program at Northwestern University has found the solution to getting students excited about learning science while helping teachers meet national and state education standards. The modules are easy to organize and inexpensive to run. They can be incorporated into any science class because of the breadth of subjects covered in the Activity and Design Project sections. Each module is a supplemental science unit that takes 1-3 weeks of class time (approximately 10 hours) to complete. Students experiment with dried firefly samples to see whether or not they produce light and under what conditions they do so. They discover that biological molecules, such as those that produce light in fireflies, can be used as materials outside the organism that produced them. By observing the signals produced by peroxidase-catalyzed reactions between peroxide and four different indicator molecules, students gain an understanding of enzymes and indicator molecules, two materials commonly used in biosensors. Students learn that enzymes are biological molecules that act as catalysts and compare how long it takes for a reaction to occur with or without an enzyme catalyst. Students learn about biosensor design by using peroxidase and an indicator molecule to make a peroxide biosensor. They learn about the concepts of dynamic range, detection limit, and biosensor accuracy by testing their biosensor to determine whether or not it can measure different concentrations of peroxide. Students use two linked enzymatic reactions and an indicator molecule to make a cholesterol biosensor. They then use their biosensor to try to determine the cholesterol levels in "patient" samples of unknown concentrations. Students consider aspects of biosensor design from the point of view of consumers and product designers. After designing their own cholesterol biosensors on paper, student read and article about a commercial biosensor design team and the cholesterol biosensor they designed for home use. Students learn about the challenges the team faced and evaluate the team's design. Students research and write a formal report about a biosensor of their choice. The report should include a history of the biosensor's development and an explanation of how it works and how it is used. From their research, students should gain an understanding of the ways in which science, technology, and society are linked. Students use what they have learned about enzymes, indicator molecules, and biosensors to design, test, and evaluate a glucose biosensor. 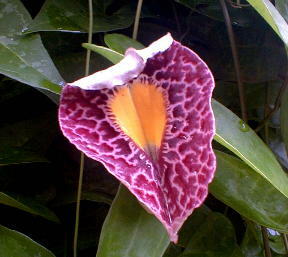 In South America, some people treat the bite of a highly poisonous reptile – the fer-de-lance – by applying a potion of an extract of a beautiful native plant, Latin name Aristolochia Odoratissima. Material Data Safety Sheets (MSDS) have valuable information concerning substances used in this MWM kit.